The Global Positioning System 2R-13 satellite, built by Lockheed Martin, will replace an older craft in the U.S. military's navigation network. After a nerve-racking stay on its Cape Canaveral launch pad with uncomfortably close encounters by two powerful hurricanes, a Boeing Delta 2 rocket finally thundered into space today where it successfully deployed a Global Positioning System satellite to aid U.S. military forces around the world. The 126-foot tall blue and white rocket departed pad 17B at 12:39 a.m. EST (0539 GMT), briefly turning the Florida nighttime into day with a blinding light. Twenty-five minutes later, the Lockheed Martin-built GPS 2R-13 spacecraft was released from the rocket's third stage, marking the 61st consecutive successful Delta 2 mission in seven years. "Deploying this GPS satellite will improve the constellation, and consequently our war fighting capability, as we continue to combat global terrorism," said Lt. Col. L.C. Coffey, the Air Force launch director. 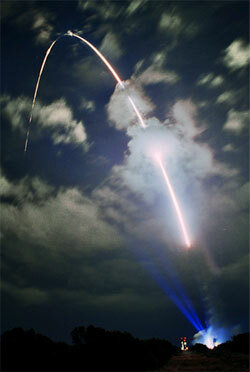 "America relies heavily on space and missile forces for its national defense. Military leaders can destroy a target with one GPS-guided bomb that took an average of 648 bombs to destroy in World War II," added Col. Mark Owen, 45th Space Wing commander at Cape Canaveral and Patrick Air Force Base. "This satellite will join a constellation that is playing a stellar role in ensuring U.S. war fighters have the tools needed to continue to fight and win today and in the years ahead." But getting this replacement GPS satellite in Earth orbit wasn't easy thanks to Mother Nature and technical snags along the way. The mission was supposed to fly six weeks ago, but Hurricanes Frances and Jeanne halted pre-launch activities as workers evacuated the Cape and then required significant inspections and testing after the storms to ensure the rocket was unharmed. The Delta vehicle operated as advertised this morning, providing the ultimate proof that flying debris swirling around launch pad during the hurricanes caused no damage to the exposed rocket. "I'm extremely proud of this team's sharp focus on mission success even while dealing with the chaos, property losses and personal disruptions brought about by the unusually severe hurricane season," said Col. Al Ballenger, system program director in the GPS Joint Program Office at Los Angeles Air Force Base. Today's launch was the first from Cape Canaveral since the extraordinary back-to-back hurricanes in September. The $45 million GPS satellite will be maneuvered into the orbiting constellation during the coming weeks. Once checked out by ground controllers, the craft will replace the oldest GPS satellite currently serving in one of the network's primary positions. 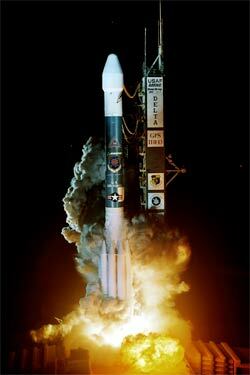 GPS 2R-13 will assume the Plane D, Slot 1 position, taking over for the GPS 2A-11 craft launched in July 1991. The aging satellite is relying on its last remaining clock after functioning well beyond its seven-year design life. The GPS constellation features 24 primary and several backup satellites split into six orbital planes. The Air Force continues to launch new satellites as replacements to keep the critical navigation system in good health. "The mean age of all of the satellite I have up there today is actually exceeding the original design life of all of the satellites. So we feel it is important to continue our launch campaign over the next several years to ensure that we never allow the capability to drop below the 24 satellites in the constellation," Ballenger said. "Our commitment has traditionally been to ensure a 95 percent confidence that we are always going to have 24 satellites in our constellation. More importantly, it's 24 satellites in the right slots in the constellation." The Air Force examines the fleet in deciding which orbital slot to target a new satellite launch. "We look at the whole constellation and which satellites are in which slots and also what the impact would be of a particular satellite if it failed," Ballenger said. "We'll also want to be in a position to minimize the impact of a single satellite failing. Each satellite on-orbit goes around the Earth twice a day. So relative to any point on the globe, the satellites are always moving across the sky. For one the receivers to really give the best navigation solution, it wants to be able to see as many satellites as possible. Depending on where you are on the globe, we have models that look at the constellation and where a particular failure might be and we figure out where it could do the most damage. So that is the slot, plane that we target to make sure we are going to keep it updated." As older craft begin to show signs of wear, controllers carefully monitor each satellite to prevent one from failing before it can be disposed. "We are getting pretty good at predicting about how much life is left in each one," Ballenger said. "One of the things we really don't want to allow to happen is to let one of the satellites fail in such a way that is becomes uncontrollable or that it becomes space junk before we have the opportunity to boost it out of the operational orbit and get out of the way of the rest of the constellation. So we carefully look at each one of those and we'll make an assessment on which ones really have outlived their useful life." 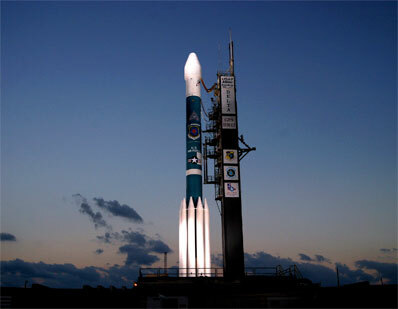 Today's launch was the 52nd for a GPS satellite and the 41st carried on a Delta 2 rocket. It marked the 13th in the Block 2R series and the last of the current configuration. "With the successful launch of GPS 2R-13, the world-wide navigation system for both military and civil users is more robust than ever," said Dave Podlesney, GPS 2R program director at Lockheed Martin Space Systems in Valley Forge, Pennsylvania. "We take great pride in our partnership with the Air Force in carrying out the important mission of the GPS system and look forward to providing significantly improved positioning capabilities as we transition to the modernized fleet of 2R spacecraft." Starting with the next satellite, now slated for liftoff in May, the craft will be upgraded to include two new military signals and a second civilian signal. "These improvements will provide greater accuracy, better resistance to interference and enhance performance for all users. The M-code signal will provide the war fighters with a more robust jam-resistant signal, enabling effective munitions targeting in stressed and hostile environments," Ballenger said. Eight of the so-called Block 2R-Modernized craft are awaiting launch. The first is currently undergoing thermal vacuum chamber testing at Lockheed Martin in advance of shipment to Cape Canaveral in February. The next Delta 2 rocket launch is right around the corner. NASA's Swift gamma-ray observatory is scheduled for liftoff November 17 from Cape Canaveral's pad 17A. The satellite is scheduled for delivery to the pad on Monday.